The recent Royal Welsh Show 2012 gave St Merryn Foods’ beef and lamb farmers a backdrop to compete for prizes and prestige, as sirloin steaks and racks of lamb from their best animals were tasted by a panel of judges. With the support of retail partner Tesco, and building on the success of last year’s sirloin steak competition, racks of lamb were added as a new element. The top ten sirloins and lamb racks were cooked by chefs from Welsh red meat promotion body Hybu Cig Cymru (HCC), which supported the competition through the use of its facilities and staff. The judges from St Merryn Foods, Tesco, and HCC looked for the sirloins and lamb racks with the best combination of tenderness, taste and succulence. 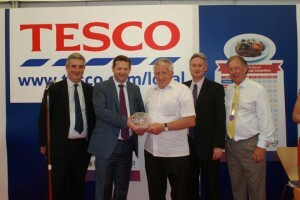 The awards ceremony saw all the finalists, together with red meat industry leaders, gather at the Tesco stand. Alun Davies (AM), the Welsh deputy minister for Agriculture, Food, Fisheries and European Programmes, made the presentations. The first prize winner, R.H & C.E Davies for sirloin received a cheque for £1,000 and a cut glass bowl. The rack of lamb winner, P.L & M.O Watkins received a similar bowl and a cheque for £500. All the prize money was donated by Tesco. Vion red meat livestock director, John Dracup hosted the awards ceremony and praised the producers for the quality of their products. His words of praise were echoed by Dai Davies the chairman of HCC, and Mark Grant, the lead Tesco buyer for Wales and the West Midlands. John Dracup - Vion red meat livestock director, Alun Davies - Deputy Minister for Agriculture Food, Fisheries and European programmes, Hywel Davies - winner beef steak competition, Mark Grant – Tesco, Dai Davies - Chairman HCC.